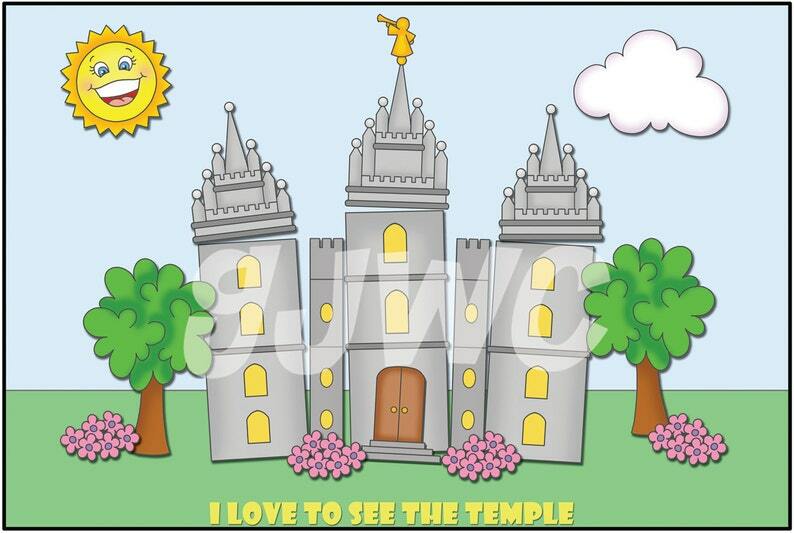 This file folder game features the LDS Salt Lake Temple. Your child will enjoy putting all the fun items in this cute file folder game. In this game you get a 2 piece background to glue on the inside of a file folder. Then you will get 17 different pieces to place in the game to build the picture. It comes full color, ready to print and cut out. Everything fits on an 8 1/2" x 11" sheet. There are instructions included on how to make it, and how to play with it. You can print them yourself, or take them to Walmart, Staples, or somewhere similar to have them printed. If you laminate the game or use clear contact paper it will last for years of enjoyment! The art for this item is great, (beautiful) unfortunately I can't use it. There is no template on the background papers. Small children wouldn't be able to match shapes, or colors or anything to know where to place the pieces. You have all these great temple pieces, and basically a blank background. Perhaps older kids could build the scene, if they had a picture to look at. I needed a picture to look at to build it. However, I was looking for things for young children.